Anyone else on the board a fan of John's Pizzeria on Western? I'm not a native Chicagoan, but this place seems about as classic Chicago as you can get. John's serves up a pretty good Midwest tavern-style pizza. Square slices, crispy crust, sweet red sauce. I rank John's as the best pizza in its neighborhood, not the best of its style in the city by any means, but its consistently good. Dining in is a must, effortless zero-ambiance is completely compelling here. 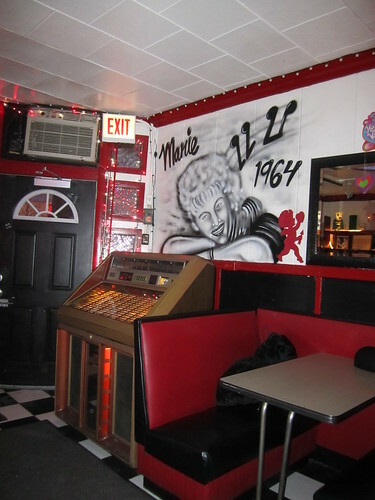 Jukebox, four plays for a dollar. Favorite from our last visit: "Incense and Peppermints" by The Strawberry Alarm Clock. I'm ready for a new mystery. The place is quite large, so you'll never have to wait for a table. Multiple visits are recommended so you can experience the ageless qualities of each of the four separate dining areas. We typically order the sausage but the Roman pizza is quite enjoyable as well. Count me as a fan, always enjoyed the pizza whether dining in or delivery. Thanks for posting about John's. It's been a long time since I've been to John's, but when I lived closer to that area, it was my go-to pizza joint and they never let me down. I always like the crisp crust, good quality toppings and the fact that the sauce was more balanced than most and nicely seasoned . . . hence, not too sweet - I've never been a fan of sweet sauced pizzas which are frequently found in Chicago. I first heard of John's when I was in law school and living near DePaul. They left a flier at our apartment building and we ordered in for delivery. We liked it so much that we then began going there regularly and the staff was always very friendly and welcoming and I loved the old school charm. Now, I'll occasionally drive by John's and it evokes such fond memories - thanks dizzy for reminding me to return. There are actually quite a few mentions of John's on this board, I like their pizza and think it is a pretty good example of Chicago "tavern" style pizza. It is also a good delivery choice for the Logan Square area. The crust is not as thin and crispy as it used to be. Back in the 70s, there was a sort of an informal competition among the taverns for the title of the thinnest, crispiest crust in town. I think this style of pizza was popular in taverns because it cooks fast, and does not occupy valuable beer-space in the diner's stomach. It was more of a snack to share while drinking than a full on meal. Kind of like nachos. Unfortunately, when the media talks about "Chicago" pizza, deep dish gut-busters always overshadow the more delicate tavern style pizzas which are as much (if not more) of a Chicago tradition. I'm down with John's Pizza. I live around the corner and it's my go-to place for pizza in the neighborhood; I usually order the John's Special. I don't think it'd be a destination if I didn't live near it, but I'm definitely glad it's there. Agree on the atmosphere too, I love the old-school feel of the place; it makes me feel like a kid again. Used to live right across the street and putting away half a Godzilla pizza (pretty much every topping they have) was a regular occurrence. IIRC, both John's and the nearby Congress Pizzeria claim to have originated the "football" pizza, which I haven't run across elsewhere. John's was decidedly better. Thanks for posting the pictures - I forgot about that great placemat. I'm a fan of John's as well. I lived across the street (above the mattress store) when I first moved to the city about 6 yrs. ago. When moving in my mom exclaimed over it, citing it as one of the hangouts when she grew up a few blocks over on Maplewood back in the '50s. After moving north for a while and now back in the Wicker Park area I'm glad John's is now a viable take out option. As for their football-sized pizzas- we went with a party of 8 and thought 3 of those would be a good order...good lord did we have leftovers. Cheesy, delicious leftovers. d4v3 wrote: There are actually quite a few mentions of John's on this board, I like their pizza and think it is a pretty good example of Chicago "tavern" style pizza. It is also a good delivery choice for the Logan Square area. The crust is not as thin and crispy as it used to be. Back in the 70s, there was a sort of an informal competition among the taverns for the title of the thinnest, crispiest crust in town. I think this style of pizza was popular in taverns because it cooks fast, and does not occupy valuable beer-space in the diner's stomach. It was more of a snack to share while drinking than a full on meal. Kind of like nachos. Unfortunately, when the media talks about "Chicago" pizza, deep dish gut-busters always overshadow the more delicate tavern style pizzas which are as much (if not more) of a Chicago tradition. Agreed. As a born-and-bread East Coaster, I've always belived that Chicago thin crust was more like nachos - a nice snack that used to be given away free at bars rather than an artisanal product (IIRC, that the Marquette Inns in the Loop used to do so during happy hour). The pizzas are made quickly - and thus more cost-effectively - by flattening the dough in an automated pastry roller rather than tossing it by hand (hence the cracker-y crust). That said, John's is a good example of the type. There was a John's in my neighborhood back in the 1970's (Foster and Christiana, I believe). Looked really similar to the photo above. Recognizing that you can't get a more generic name for a pizzeria than "John's" (anyone remember the three-pack John's frozen pizzas of the early '70's?) does anyone know if there's a connection between this John's and the other one? Might be worth a nostalgia visit. I've passed John's many times and it definitely looks 'right'. In fact, for a while I had it confused with a place my dad used to take me as a kid before Blackhawk games at the old Stadium back in the 1960's. That place was called Jumbo John's, then Capizzi's, then back to Jumbo John's, right near Grand & Damen. In fact, it might still be there. What a place that was--upon entry, you opened up a flat cooler & grabbed a bottle of Coca-Cola or Fanta grape, then sat down at one of about 8 rickety Formica tables. Jumbo John's was run by a couple of older Italian women with crooked horn-rimmed glasses, and man could they cook! Meatball, sausage or combo sandwiches, spaghetti/mostaccioli, or slices of pizza. That was about it. And we were in & out in 30 minutes, on our way to see the likes of Hull & Mikita. Has anybody been to Jumbo John's recently? While I agree with you about the origin of "tavern" pizza, not all crispy thin crust pizzas are machine rolled. For instance Villa Nova in Stickney, hand tosses their pizza. I would also definitely classify VN's pizza as an artisanal product. Then again, VN is not a tavern. Just because the pizza is of that style does not mean it is not well made. special note to jnm123 --- Since about 1990 Jumbo John's / Capizzi's is no longer at Grand and Damen. When they closed and knocked down the building, I thought all was lost... until about 2 years ago. And they are still serving the same SQUARE pizza slices also. This post not to take away anything from Johns on Western. Johns has been a regular stop for me since I was a kid and visiting my Grandmother who lived 2 blocks away during the 60's. Johns food and especially the pizza is STILL A MUST whenever I get into the area... ( And I was just there again last week). .... and now my youngest son and my brother in law are also HOOKED on the pizza. Cash only at John's for delivery. It's my go to delivery if I have cash. I too hate sweet sauce pizza, so I was surprised to see the OP said it was sweet. It's no D'Ags for sure. But then again, I always get the Sicilian, so maybe the onions, sausage, mushrooms, pepers cancel out the sweetnes..
nicinchic wrote: Cash only at John's for delivery. It's my go to delivery if I have cash. I too hate sweet sauce pizza, so I was surprised to see the OP said it was sweet. It's no D'Ags for sure. But then again, I always get the Sicilian, so maybe the onions, sausage, mushrooms, pepers cancel out the sweetnes..
You're right, I didn't intend for that to be a defining characteristic like D'Ags. It's nowhere near that level of sweet. I forgot to mention that I always order my pizza at John's "well-done". Anyone else do this? Absolutely loved it. Now, as it was delivery, I noticed some incipient sogginess creeping into the the crust -- so we ate it quickly (I mean really quickly -- I actually ate before we went out and even then I found myself gobbling like a teenager). Both of us had the same thought as we took the first bite: this is just like the pizza we used to eat at Pizza Palace in Elmhurst during the 60s. The sauce was beautiful: herby, dense, worked on in the best way, and the overall taste not at all sweet (could have been the type of pizza we ordered: just pepperoni and mushroom, neither of which brings much much sweet to the game). Marie's has apparently had a relationship with John's since they both opened about half-century ago. Althought there was recently a threat that Marie's might close, they've found investors, bought some flat screens (alas), changed the funky old sign out front (for a funky new sign) and the place looks to be gearing up for another 50 years. Love John's. I go well-done, sausage giardiniera, pick-up always. Great version of Barnaby's tavern square cut pie. jazzman wrote: special note to jnm123 --- Since about 1990 Jumbo John's / Capizzi's is no longer at Grand and Damen. My wife's lasagna was a generous 7" x 5" x 3" portion with a great ricotta/parsley mix. I thought the accompanying Italian sausage was decent but not my favorite, because that densely-stuffed, non-fennel variety is not my preference. However, the meatballs are definitely the real deal, the exact recipe from 60 years ago, and were a solid counterpoint to my mostaccioli with perfectly serviceable marinara sauce. Oh, those accoutrements are an extra $1.95 with pasta. The total bill including a salad & a 7-up was $19.63. Is this incredibly-priced joint a destination? Well, maybe not, but the sheer funkiness of Lo-Lo's, with its mismatched tables & cool setting, is worth a trip in Mr. Peabody's wayback machine for my money. Regarding Lo-Lo's, it's the closest thing to a Capizzi's pizza that we've had in a long, long time. Turns out their pizza maker, Jeff, used to work at Jumbo John's on Grand, and, if you're a Capizzi's fan, you know that's where you could get their pizzas from after the restaurant near North & Austin closed. It's the same sweet-tasting sauce and of course the one piece of sausage per slice. Try this place out if you need a Capizzi's fix. I went last fall with mbh and some friends and fell in love. After that first trip, I ate there approximately 6 times in 10 days. Really addictive. Nice folks as well. Driven past hundreds of times and never knew anyone who mentioned John’s pizza. Prompted by Mr. Hammond’s excellent review, I had to try it. 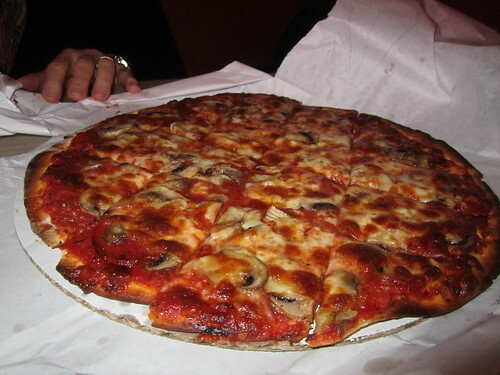 This is terrific, old school Chicago style pizza, like I grew up with. In the 60’s thru 80’s every neighborhood had at least one great pizza option like this. My two favorite’s near my home growing up were Vito’s on North, west of Pulaski, or Livia’s on Pulaski, just north of Augusta. But neighborhood pizza joints were plentiful. I wanted to give them their best chance to shine and didn’t bring one home or follow David’s choice and bring one Marie’s Rip Tide Lounge. I decided to eat at John’s. John’s didn’t disappoint. Simple sausage and onion, and Mr. Wiviott style, well done. Delicious sausage with a healthy amount of fennel. Loved the sauce that wasn’t shy with the herbs. Small diced onions that didn’t render excess moisture. Not greasy. Everything applied to the edges, no inch plus of naked crust. I don’t eat pizza with meat or dairy very often anymore, I’m sure it’s been over a year. This was a real treat. But think I’ll take one to Marie’s next time. Last edited by Al Ehrhardt on February 15th, 2019, 8:26 pm, edited 1 time in total. Sorry Al, but I don't believe that either Marie or the Riptide Lounge are around anymore.